The male stamens always look collapsed because with so many other fragrant cream flowers they mainly bloom at night. The flower is a spectacular attraction at any monsoon garden party. How about a small evergreen tree with glossy smooth leaves and fragrant blossom? 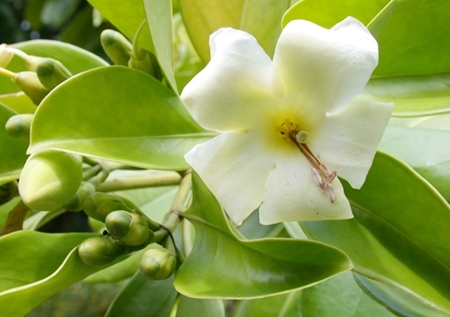 The Ceylon fagraea (Fagraea ceilanica, Gentianaceae) is a good option for a small monsoon garden. This small tree could as well be treated as a shrub or even a climber if supported. I like it for its lovely foliage, thick and firm, and the cream flowers which emerge right now have a very appealing scent. The plant is native to Sri Lanka, India and Southeast Asia including Thailand, and prefers a sunny but wet environment, so do not forget to water it during droughts such as the one we experience now (June 2012 had only 26 mm of precipitation, mostly in the beginning and only in seven of 30 days). The species name ‘ceilanica’ (not ‘ceylanica’ which is a common incorrect spelling) was coined by Linnaeus’ disciple Carl Peter Thunberg (1743-1828), who visited Ceylon when he returned from Japan in July 1777. The scientific genus name ‘Fagraea’ was also coined by Thunberg after another Linnaeus disciple, the Swedish naturalist and physician Jonas Theodor Fagraeus (1729-1797).